These FAQ's were collected from rmd, the 10-year-old Dylan usenet group and valuable resource for any Dylan fan. These FAQs are arranged in approximate order of the frequency they appear on the newsgroup. Q. How can I send a letter so that Dylan will read it? A. You can't. It's highly unlikely that Dylan reads his own mail. In a 1969 interview with Jann Wenner, Dylan said, "My secretary arranges the fan letters into three piles: I hate you, I love you, and I want to 'make it' with you. I only read the first pile." That's paraphrased, but it's safe to assume that a secretary still opens Dylan's fan mail, although it's doubtful that much of it, if any, reaches Dylan. These two addresses have been posted to rmd many times. Q. Is Dylan on the 'net? A.This seems unlikely, despite a few posts dragged from the archives of rmd or from various chat rooms. One famous incident from a Dylan chat room was described in Mojo Magazine. Apparently, some jokester, trying to prove he was really Dylan, said he would play the previously un-played "Highlands" in concert to prove that he was really the man. When "Highlands" was played, a flurry of Dylanites became convinced that he is on the 'net. The set lists are certainly printed on a computer in a font resembling Comic Sans Serif. And they are always the same, so Dylan's tour is definitely equipped with some kind of computer or at least, a fax machine. Thus, it is possible that Dylan surfs the web, but I think it's a long shot at best. To view set lists, see Bob Dates. A. Mostly, on his tour bus. See About the time the doorknob broke.... His residence in Malibu, California, is often described as a mansion. It is a beautiful home which was custom-designed and built for the Dylans. However, it's not an enormous palace. Here's a photograph of his veranda in Malibu. Dylan also owns a farm in Minnesota. He probably maintains a residence in New York City as the tours seem to start and end at the east coast. Another residence is Dylan's houseboat, an ocean-going vessel. And yet another 'cabin' is upstate New York, according to an acquaintance of mine who met him. Her friend is a carpenter and was doing some work on his 'cabin.' The New York Times reported that Dylan has five residences in New York. I imagine that there might be some East Coast ocean-front property among Dylan's real estate. And a site visitor wrote,"It is known locally that Bob has bought some property in Nova Scotia. Whether there is an actual HOUSE on this property, nobody seems to know, but he has been seen around Halifax. I think he'd like it there." Q. How tall is Dylan? A. No-one knows. This thread re-surfaces on rmd again and again.. I'd say around 5'8, but I've always been below Dylan, as I've only seen him on stage. I'm not sure why people are so interested, but Peter Stone Brown posted that he stood next to Dylan and that he is about 5'7 or 5'8. Certainly not tall, in fact, 5'7" is the average height of the American male. Q. Is that Dylan's real hair? A. Seems to be. As Letterman quipped, who would buy a toupee that looks like that? Despite his age Dylan still has a thick curly mop, although it's gotten considerably greyer in recent years. His father and his brother were/are balding, so it seems that Dylan should logically be losing his hair, but he isn't. Attribute this to his Jewish heritage, pure luck, or proper maintenace. The color varies from year to year, and even his eyebrows appear to be sometimes grey, sometimes dark brown. Q. Is Dylan dating Raquel Welch (or Joan Osbourne, or Jewel, or some other woman)? Q. 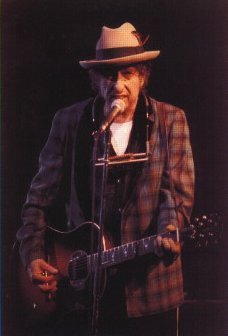 Is Bob Dylan a practicing Jew/Christian/other? A. Although Dylan has been a practicing Jew as well as a born-again Christian, his religious preference isn't public knowledge. No one on rmd seems to care too much about this either. Q. 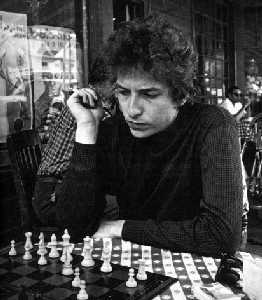 Is Bob Dylan left-handed? A. This is an interesting one. There are photographs of Dylan signing autographs with both his left and his right hands. But a site visitor reminded me that photos frequently get "mirrored" in the presentation, and that there are pictures of Bob playin' guitar left-handed too. Although he plays the guitar in the typical "righty" style, many southpaws play right-handed guitar rather than adapt their instruments for the left hand. As a Gemini, he could be ambidextrous. The only way to tell would be to throw him a baseball and see which hand comes up automatically. Since I may never have the opportunity to do this, I would venture that Bob can write with both hands and, like many children of the Fifties, was taught to write with his right hand although his natural preference was for his left.